Independent Catholic denominations, Catholics not in communion with Rome, or Breakaway Catholics, is a term for minor schismatic Christian denominations self-identifying as Catholic despite not affiliated with or recognised by the Catholic Church. Split in multiple groupings with estimated some 28 million members in total, the Independent Catholic denominations, their magistry, and sacraments are not recognised by the Catholic Church, the Eastern Orthodox Church or Oriental Orthodox Church. Independent Catholic groups, while typically employing episcopal hierarchy claiming apostolic succession, differ from Protestantism in that they identify with and practice liturgy more closely inspired by the Catholic Church. Bishops of Independent Catholic churches who were originally clergy of the Catholic Church but left are sometimes referred to as episcopi vagantes ("wandering bishops") because of their lack of communion. Their decisions to partake in schisms tend to stem from various perceived failures of the institution of the Catholic Church. The term "independent Catholic" is not usually applied to Anglo-Catholics, the Church of England or to the other denominations within the Anglican Communion. However, "Independent Catholic" is sometimes applied to denominations which consider themselves to be "Old Catholic", including the Union of Utrecht, even though it is in communion with the Anglican Communion, although not an actual member of the group. In the case of Continuing Anglicanism outside the Anglican Communion, denominations self-identifying with Catholic tradition may sometimes be considered as Independent Catholic. Various Independent Catholic groups have attracted a significant amount of criticism as part of their attention. As an example, regarding the Argentine Catholic Apostolic Church, a TV report exposed "sham" marriages by priests pretending to be of the Catholic Church, phoney miracles and fake exorcisms, as well as charitable works coupled with illegal practice of medicine, theft, securities fraud, attempted sexual corruption of minors, and other crimes. Representatives of the Catholic Church consistently warn about the dangers of associating with these bodies. Although the term Old Catholic was first used in 1853 to describe those Catholics in Utrecht in the Netherlands, most scholars date the modern Old Catholic movement to the 1870s. 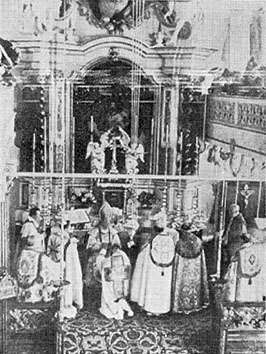 After the First Vatican Council in 1870, considerable groups of Austro-Hungarian, German and Swiss Catholics rejected the declaration of papal infallibility and left to form their own churches, independent of the pope. The churches were supported by the Old Catholic Archbishop of Utrecht, who ordained their priests and bishops. Later, they united more formally, as the Utrecht Union of Churches (UU). The "independent" Catholic movement came to Great Britain in 1908, when Arnold Harris Mathew was consecrated by Old Catholic Church of the Netherlands Archbishop Gerardus Gul. The Union of Utrecht incorrectly believed that Mathew had a significant following in the United Kingdom and that there would be a wave of clergy wanting to leave the Church of England as a result of Pope Leo XIII's declaration that Anglican orders were null and void. Mathew believed that Old Catholicism would provide a home for those disaffected clergy, but the mass conversions failed to occur. Before separating from the Union of Utrecht, Mathew ordained several individuals to the episcopacy and priesthood from whom a number of new churches quickly developed, including the Liberal Catholic Church, whose first bishop, James Ingall Wedgwood, was consecrated by Frederick Samuel Willoughby, who had been consecrated by Mathew. Joseph René Vilatte, an Old Catholic priest, is credited with being the first person to bring the independent Catholic movement to North America. In 1892, Vilatte traveled to India, where he obtained ordination to the episcopacy by the Oriental Orthodox bishops in India. Over the following 28 years, Vilatte consecrated a number of men to the episcopacy. Those bishops and their successors went on to found many different jurisdictions in North America. A number of Traditionalist Catholic groups, who have advocated for a restoration of many or all of the liturgical forms, public and private devotions and presentations of Catholic teachings which prevailed in the Catholic Church before the Second Vatican Council, have left the Roman Catholic Church and begun their own religious organizations. Most of these schismatic Traditionalist Catholics belong to the Latin Rite, although some groups are part of the Byzantine Rite. The Old Catholic Church is a Christian denomination that split from the Holy See in the 1870s because they disagreed with the solemn declaration of the doctrine of papal infallibility promulgated by the First Vatican Council (1869–1870). The Old Catholic Church holds close to ideas of ecclesiastical liberalism (Liberal Christianity). The Church is not in communion with the Holy See, though the Union of Utrecht of Old Catholic Churches is in full communion with the Anglican Communion. Some groups such as the Polish National Catholic Church arose as a result of grievances relating to the second-class status of immigrant Polish Catholics by the American Irish and German dominated church hierarchy. Ethnic grievances still play a role in the church today as in the case of St. Stanislaus Kostka Parish in St. Louis, Missouri. In 1534, King Henry VIII of England, who had previously been awarded the title "Defender of the Faith" by the Pope, signed into law the Act of Supremacy, placing the ecclesiastical governance of the Catholic Church in England (Ecclesia Anglicana), under his own jurisdiction in order to grant himself an annulment from his marriage to Catherine of Aragon, establishing the independence of the Church of England from the See of Rome. Since the English Reformation the English Church, known as the Ecclesia Anglicana or Church of England, has experienced various other reforms over the centuries, all the while maintaining its via media character as established by the Elizabethan Settlement of 1558, wherein the church was understood to be both Catholic and Reformed. Many but not all independent Catholic clergy claim descent from the Union of Utrecht member churches, but Utrecht does not officially accept their orders. Like Orthodoxy, Utrecht holds that ordinations cannot be done except within the church as a whole and with appropriate authority. Some independent groups in North America began life as Protestant and/or Charismatic congregations; for example, the Charismatic Episcopal Church came into being when charismatic fellowships rediscovered both sacramentalism and the historical apostolic succession. Another group, the Evangelical Orthodox Church (EOC), found its way into mainstream Eastern Orthodoxy: one part joined the Antiochan Orthodox Christian Archdiocese of North America in 1987: Some parishes later entered the Orthodox Church in America, but a remnant, which does not claim traditional apostolic succession, kept the name Evangelical Orthodox Church and continued as an independent church. Since the orders of the EOC were not regarded as valid by the Orthodox bishops, the reception of clergy into mainstream Orthodoxy was always accompanied by ordination. The Brazilian Catholic Apostolic Church was founded in 1945 by Bishop Carlos Duarte Costa, who withdrew from the Roman Catholic Church, opposing its position on clerical celibacy and divorce and accusing it of Fascist sympathies, which he saw evidenced in documents such as Rerum novarum, Quadragesimo anno and Divini Redemptoris. Duarte Costa went on to consecrate other bishops in Europe as well as North and South America. Several independent Catholic bodies trace their apostolic succession through Duarte Costa, including the Catholic Apostolic Church in North America. A number of liturgical churches are sometimes regarded as independent Catholics but do not fit neatly in the category. Continuing Anglican Churches are sometimes included in this grouping, but that is disputed, especially with regard to the larger Anglican bodies, and the continuing churches do not count themselves as being within the independent Catholic movement. Traditionalist Catholic groups that are in irregular standing with the Holy See (such as the SSPX, not Traditionalist groups in full communion with the Pope, such as the Priestly Fraternity of St. Peter) are sometimes regarded as independent Catholics, but they do not see themselves in this manner; rather they regard themselves as being the true church, believing that Catholicism has embraced teachings which are schismatic, or even heretical since the Second Vatican Council. A similar controversy exists regarding the Old Calendar Eastern Orthodox jurisdictions, including the Ukrainian Autocephalous Orthodox Church and bodies that split from mainstream Orthodoxy specifically in order to maintain the Old Liturgical Calendar. There have been attempts to construct broader categories to include many of these groups, such as the Independent Sacramental Movement, but most of the groups would be uncomfortable with such a characterization. Evangelical Catholic groups such as the Anglo-Lutheran Catholic Church (formerly the Evangelical Community Church-Lutheran) describe themselves as Lutheran rather than Catholic because of their Lutheran heritage and the fact that they accept the clauses of the unaltered Augsburg Confession that agree with their understanding of the Roman Catholic magisterium. Others, such as the Antiochian Catholic Church in America, describe themselves as Catholic and claim that their doctrine is based, with variations, on that of a church unrelated to the Roman Catholic Church for centuries. The Polish National Catholic Church (PNCC) is occasionally referred to as an independent Catholic church; however, the PNCC rejects the designation. The PNCC derives its orders from the Old Catholic Union of Utrecht but is no longer in communion with Utrecht or the Episcopal Church in the United States of America. The relationships ended because the PNCC rejects the ordination of both women and sexually active homosexuals. Whilst no longer in communion with any other body, the PNCC remains a relatively substantial denomination, maintaining active dialogue with the Roman Catholic and Orthodox churches. It is also a member of the World Council of Churches. Very few independent groups are as large as either the Ecumenical Catholic Communion, with 27 congregations in the United States and 6 in Europe, or The Old Catholic Church, Province of the United States with 13 congregations or the Catholic Apostolic Church in North America, with 10 congregations; most consist of one or two bishops, a few priests and deacons, and a small number of adherents. In numerous cases, bishops have been consecrated without having any priests under their jurisdiction. Some bishops have received multiple (sequential) consecrations (see below), often as conditional consecrations, in an attempt to secure a more widely recognised claim to apostolic succession, for example, Bishop Hugh George de Willmott Newman. Virtually all members of the independent movement worship according to a set liturgy, usually derived from a mainstream historical Christian rite, such as the Syriac, Byzantine, or Roman. Sometimes they use a liturgy that is a combination of two or more of these historical liturgies or one that is unique to the group in question. (It was not uncommon for leaders of the various churches in early Christianity to develop rites such as the Divine Liturgy of St. John Chrysostom, St. Basil the Great, the Milan Rite and the Byzantine Rite.) By definition, all such groups are episcopal in polity, being led by bishops and priests who are assisted by deacons. All hold to a sacramental understanding of the Christian faith related to that broadly held in common by the Catholic, Eastern Orthodox, Oriental Orthodox, Assyrian, and traditional or high church Anglican and Anglo-Catholic churches (low church or evangelical Anglicans are more Reformed in their understanding). Independent Catholicism also affirms the text of the Nicene Creed, but interpretations vary widely based upon how many councils are recognised by the independent Catholic Church in question. However, independent groups disagree on the ordination of women, homosexuality, abortion, contraception, divorce, and other issues that are controversial also in more mainstream sections of Christianity. Unlike most of their more conventional counterparts, these groups, usually being quite small, tend to be internally fairly homogeneous on these and other issues; in other words, divisions on these and other questions are between these groups, not so much within them. These independent congregations represent a variety of doctrines. Some, such as the Liberal Catholic Church, the Free Church of Antioch, the Catholic Apostolic Church of Antioch—Malabar Rite (the "Church of Antioch"), and The Young Rite are characterized by a neo-Gnostic and theosophical orientation. Other independent groups are quite conservative, following extremely traditionalist Catholic or Old Calendar Orthodox positions; still others describe themselves as "Evangelical Catholic" and High Church Lutheran. The claims of many within the independent movement to continuity with holy orders, as found in Roman Catholicism, Eastern Orthodoxy and Oriental Orthodoxy, are based, at least in part, on an understanding of apostolic succession held by some within the Latin Church since the time of the Donatist controversy in the 4th and 5th centuries AD. According to those who hold that view, a person becomes a bishop if consecrated in an approved rite by another (validly ordained) bishop even when he is outside the boundaries of Catholicism. However, some theologians consider this view to be mechanical and reductionist and hold that an episcopal ordination is for service within a specific Christian church, and an ordination ceremony that concerns only the individual himself does not make him truly a bishop and are without effect. That view has been affirmed, for instance, by the International Bishops' Conference of the Old Catholic Church with regard to ordinations by Arnold Mathew, Independent clergy reject the characterisation, seeing their bishops as always ordained for the service of others and for the Christian community, whether in a defined jurisdiction or more broadly. The Eastern Orthodox Church and the Coptic Church and the other churches of Oriental Orthodoxy completely reject the validity of the ordinations of heretics or schismatics and thus do not recognise the orders of independent clergy, whom they place in those categories. While the Roman Catholic Church has more than once declared that certain episcopal consecrations have no canonical effect, it has occasionally stated that it was not thereby expressing a judgement on the validity but merely on their canonical efficacy (see also Valid but illicit). When it declared the consecrations performed by Archbishop Pierre Martin Ngô Đình Thục for the Christian Palmarian Church of the Carmelites of the Holy Face devoid of canonical effect on 31 December 1975, it refrained from pronouncing on its validity. It made the same statement about later ordinations by those bishops, saying that, "those who have been ordained in this unlawful manner, or who may in the future be ordained by them, whatever about the validity of their orders, the Church does not recognize their ordination nor shall it do so, and she considers them, as regards all legal effects, in the state which each one had beforehand and subject to" penal sanctions of 1917 Code of Canon Law canons 2370 and 2373 §1, §3, as well as excommunication reserved to the Apostolic See mentioned in a 1951 decree. The clause "in the state which each one had beforehand" indicates that the Holy See views as juridically laymen those whose sole claim to be clergy is based on the ordinations in question. The Holy See of the Roman Catholic Church did not question the validity of the 1988 Ecône consecrations by Archbishop Marcel Lefebvre for the Society of St. Pius X that he had founded. Lefebvre was capable of forming the necessary intention while questions were raised regarding the mental capacity of Archbishops Ngô and Milingo to perform ordinations according to the understanding of the Roman Catholic Church. Ngô was advanced in age and possibly suffering from dementia and Milingo had undergone a marriage conducted by the Unification Church, which would raise questions about his theology; the Vatican statement concerning Milingo also refers to him as "elderly" with obvious attendant implications. The official view of the Eastern Orthodox churches may be summarised as follows: "Thus, the Orthodox Church, while accepting the canonical possibility of recognising the existence (υποστατόν) of sacraments performed outside herself, it questions their validity (έγκυρον) and certainly rejects their efficacy (ενεργόν)." It sees "the canonical recognition (αναγνώρισις) of the validity of sacraments performed outside the Orthodox Church (as referring) to the validity of the sacraments only of those who join the Orthodox Church (individually or as a body)." The Orthodox Communion will not accept as valid any ordination ceremonies of clergy not accepted into their own communion. Some independent clergy have undergone more than one ceremony of ordination to priesthood and/or episcopacy at the hands of bishops having different lines of apostolic succession, with a view to ensure a broader and more diverse claim to valid holy orders and apostolic succession. The bishop conducting such a ceremony may use conditional language on the lines of "If you are not already ordained (or consecrated a bishop), I now ordain you (or consecrate you a bishop)". Sometimes, a series of such ceremonies is undergone. In what is called "cross-consecration", bishops representing different lines of apostolic succession consecrate each other to multiply the claims of each to genuine apostolic succession. Practices of such nature continue but are perhaps less prevalent than in the past. As an example, Archbishop Peter Paul Brennan of the African Orthodox Church, one of four conditionally ordained to the episcopate on 24 September 2006 by Roman Catholic Archbishop Emmanuel Milingo, who was therefore excommunicated, claims to have been first consecrated on 10 June 1978 and to have been subsequently conditionally reconsecrated several times before participating in the Milingo ceremony. Hugh George de Willmott Newman is a notable example of an individual who was conditionally consecrated numerous times. Over a period of ten years between 1945 and 1955, Newman took part in several ceremonies of conditional consecration and cross-consecration. It was Newman's aspiration that individual bishops would carry not just one or two historic lines or streams of apostolic succession but numerous different lines or streams, converging to form an ecumenical apostolic succession. ↑ "Rechazan una demanda iniciada por un religioso". diariojudicial.com (in Spanish). Buenos Aires. 2010-07-16. Archived from the original on 2015-10-17. Retrieved 2015-10-17. 1 2 3 Kemp, Alan R. (ed.). "A brief history of Independent Catholicism in North America". concentric.net. Ascension Alliance. Archived from the original on 2013-09-28. Retrieved 2014-06-15. ↑ "Manifesto to the Nations". clinicaltheologist.org. North American Catholic Apostolic Church. A New Ecumenical Ministry of Applied Theology. 2009. Archived from the original on 2013-09-02. Retrieved 2014-06-15. ↑ "Parishes in the United States". ecumenical-catholic-communion.org. Orange, CA: Saint Matthew Ecumenical Old Catholic Church. Archived from the original on 2014-03-02. Retrieved 2014-06-16. ↑ "Parishes & missions". cacina.org. Herndon, VA: Catholic Apostolic Church in North America. Archived from the original on 2014-06-16. Retrieved 2014-06-16. ↑ Sacra Congregatio pro doctrina Fidei (1976-09-17). [http://www.vatican.va/archive/aas/documents/AAS%2068%20%20-%20ocr.pdf "Decretum circa quasdam illegitimas ordinationes presbyterales et episcopales"] (PDF). Acta Apostolicae Sedis (in Latin) (published 1976-10-31). 68 (10): 623. ISSN 0001-5199. Translated in Congregation for the Doctrine of the Faith (1976-09-17). "Decree concerning certain unlawful priestly and episcopal ordinations". L'Osservatore Romano (published 1976-09-30). p. 1. Archived from the original on 2012-01-04. Retrieved 2014-06-15 – via vatican.va. ↑ Sacra Congregatio Sancti Officii (1951-04-09). [http://www.vatican.va/archive/aas/documents/AAS%2043%20%20-%20ocr.pdf "Decretum de consecratione episcopi sine canonica provisione"] (PDF). Acta Apostolicae Sedis (in Latin) (published 1951-04-21). 43 (5): 217–218. ISSN 0001-5199. 1 2 Pheidas, Vlassios. "Chapter I". The limits of the church in an orthodox perspective. Myriobiblos: The online library of the Church of Greece. Online Cultural Center of the Church of Greece. Archived from the original on 2005-10-30. Retrieved 2013-05-14. "Chapter II". Archived from the original on 2005-10-30. Retrieved 2013-05-14. ↑ Boyle, Terrence J. "The Brennan lineage". tboyle.net. Washington, DC: Terrence J. Boyle. Archived from the original on 2013-12-20. Retrieved 2014-06-15. ↑ Glatz, Carol; Filteau, Jerry (2006-09-26). "Vatican says Archbishop Milingo, four others incur excommunication". catholicnews.com. Washington DC: Catholic News Service.